Global streaming giant Netflix has picked up a pair of animated kids’ series from Canadian producer and distributor Portfolio Entertainment. Long-running preschool show The Cat in the Hat Knows a Lot About That! and comedy series Freaktown with both be available to Netflix users in various territories. Originally produced by Portfolio for PBS Kids, The Cat in the Hat Knows a Lot About That! (40×30’) features Dr Seuss’s eponymous feline as he takes his curious young protégés, Nick and Sally, on extraordinary adventures in the natural world. Netflix will stream the whimsical tales of The Cat in the Hat in 135 territories, including the UK, Italy, France, Australia, New Zealand, Spain, Portugal, the Nordics, Latin America and the MENA region. Freaktown (26×30’), meanwhile, is a slapstick comedy aimed at eight- to 12-year-olds and was originally produced by Portfolio for Teletoon in Canada. Netflix has picked it up for subscribers in Portugal and Spain. 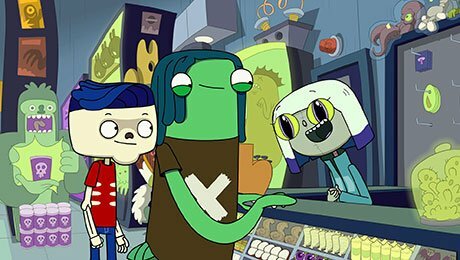 The show invites kids to join best friends Ben Bones (a skeleton with soul) and Lenny (a laid-back mutant mantis) on madcap adventures in their hometown, a place where ghouls, mutants, misfits and oddities of every sort are welcome. Both programmes were supported by the CMF and Shaw Rocket Fund.